TouchStone is an email reporting and analytics platform that allows users to take advantage of the full potential that email marketing has to offer. In this fascinating interview, Founder & CEO Dela Quist talks about how GDPR has affected their business and shares his controversial views on the future of email marketing. Unlike most people in the email marketing spaceת my background is in publishing and media rather than direct Marketing (DM). I started out in magazine publishing; magazines for specialists such as Computerת World a specialist magazine for the IT community. From the very beginning, I realized specialist magazine publishing is database marketing. Ads placed within the title provided an interface between the advertiser and the reader, and as such, the success of an Ad placed in the magazine depended on the quality of the list or readership. When the internet first began to take off, I was extremely excited by the phenomenon and very keen to move into the digital space because I realized immediately that online the interface or web page was responsive. The target audience could interact directly with the brand placing the advertising. That realization is what led me to start working with excite.com, one of the biggest search engines in the world at the time, before the launch of Google. During my time there I got involved with the launch of Excite’s free webmail project and began to see from my publishing background that email marketing was in effect a form of customer publishing. Done correctly, a brand was able to place their own marketing messages and content in front of their customers and prospects, without having to pay a 3rd party, be that with an online publisher like Facebook or search engines like Google. Better still the cost of sending the message out to those people was even then less than a penny! By comparison, sending the same message to those people on paper via the postal service was over 100 times more expensive. So, in 2001, I founded my first business, Alchemy Worx, the UK’s and arguably the world’s first marketing agency with an exclusive focus on email. Alchemy Worx will be 19 years old next year. And we are still very much involved in helping brands to do better email marketing. We have always been technology agnostic; our belief is a good marketer with a poor platform will always beat a poor marketer using a good platform. We let the customer buy the bus and then we drive it for them. We do strategy, creative, segmentation and targeting, design, and basically everything to do with building and sustaining long-term relationships with customers and prospects using the email channel. How do I improve my open rates? How do I stop people from unsubscribing? What call to action is most effective? How do I get into the inbox instead of the spam folder? Our clients were challenging us with these questions, and we quickly came to realize that all the email platforms out there, were (quite rightly) focussed on getting emails out the door and into the selected inbox. However, when it came to reporting tools and analytic capabilities, their view was and still is – we provide you with access to ALL the data via the API, it’s up to you to go get it and create any report that you want. 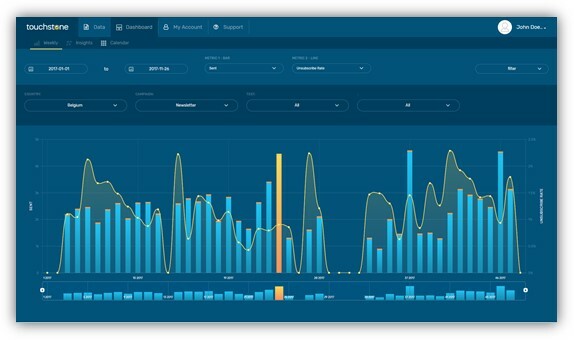 This is still true today; whether you use an Enterprise scale platform Like Salesforce Adobe or IBM, or platforms like MailChimp, designed for small businesses; With the reporting and analytics capabilities that come with these tools, you would not be able to answer any of the above questions without exporting the data via the API and manually building your own reports. I call it the gap in the Marketing Cloud. We ended developing our own reporting and analytical tools in order to make sense out of the campaigns and give our clients strategies that we knew would work. We learned as have many people before us that Service and Software businesses make uncomfortable bedfellows, so about 2 years ago we began the process of separating the two businesses. The company that I’m running actively today is Touchstone Intelligent Marketing, the software business, and our Reporting and Analytics platform can best be described as the Google Analytics (GA) for Email. Almost everyone with a website that drives business will use GA to see which visitors come to their website and when they visit. The more you know about the past, the more prepared you are for the future, and the abler you are to contextualize what’s going on. If you have a website and it drives business, you will use it so you can create a better environment for what they’ll do in the future. Which makes it all the more puzzling that before Touchstone, no such tool existed in the email space. The email market has had to live for many years with sub-standard analytics. Touchstone has fixed that. Our vision has been to create a tool for Marketers with the kind of functionality that everybody with a commercial website takes for granted, but is completely absent to people running commercial email programs, despite the importance to the business and sheer quantity of emails going out every day. There are probably several hundred times more emails sent every day than there are web pages in the entire web. If you think of email as a web page delivered to the customer inbox, you can see the advertising opportunity and the value of Touchstone. How Does Touchstone Approach Behavioral Analytics? One thing we have learned over the last 18 or so years is that while human behavior is very predictable in large numbers, predicting what an individual will do is MUCH more challenging. To explain what I mean I would like to use the annual migration of 1.5 million wildebeest in East Africa to illustrate my point. Every year the wildebeest are forced to cross a number of rivers that stand between them and fresh food. They have been doing so for millennia. So, hunters and scavengers of every type – most famously crocodiles, can predict that at the same time every year, several hundred thousand wildebeest (see image below) will be forced to cross the river at that particular point. You could bet your house on it. 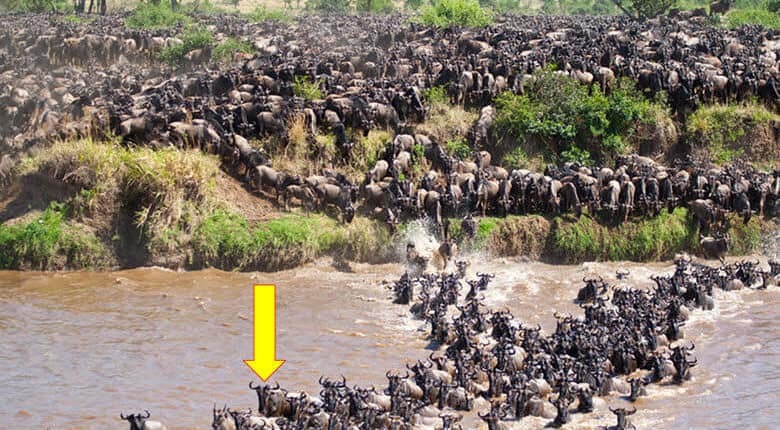 If you look closer at the image you will see a big yellow arrow pointing to a particular wildebeest. Now tell me how much you would bet on that particular animal returning next year. If you have any sense you would not place that bet. That, in essence, is the challenge facing anyone trying to analyze behavior at the individual subscriber level. We started tracking subscriber level interactions over time back in 2007. For every email that you send, every person on your database could be sent the email, or not; if they were, they can open or not; if they open it they may click or not; if they click, they could purchase or not; or they could unsubscribe, or not. If you look at the fact that many large brands send up to 10 emails per week to several million people, you can begin to see how big the problem is. It’s exponentially more challenging to understand, predict and respond to every individual’s behavior than it is to predict that more people will be looking to spend money this payday – or black Friday. So even though we have been able to predict exactly who is most likely to open the next email you send for at least 7 years, we quickly realized that subscriber level analytics just doesn’t scale as a business. The only way to scale a predictive analytics business is to use machine learning algorithms to come up with aggregated subscriber level insights, by creating a platform to better organize, archive and label email campaigns prior to the analysis. How has GDPR changed the way you do business? GDPR requires companies to obtain consent or permission from subscribers and customers, and use their data for marketing. This is something email marketers were already required to do, so, for the most part, it has been business as usual for us. Where GDPR really made a difference to us is it has created an even stronger business case for our platform than before. GDPR makes it difficult to scale a business that is built around subscriber level analytics, which by definition requires the use of Personally Identifiable Information (PII). Brands, therefore, have to be extremely careful about who they entrust their customers’ PII with. Breaches are a big problem. When people give you permission to send them emails, they expect you to protect their information and not use it in a way that they would find unacceptable. From a GDPR perspective, if you want an analytics tool that will help you understand what’s going on in your campaigns, and benchmark against other brands in the marketplace, or other emails that are going out the door, Touchstone is the only tool that can allow you to do it. Touchstone doesn’t use Personally identifiable information (PII); it only uses campaign information. Our algorithms and machine learning capabilities analyze the campaigns in a unique way. We use AI to make subscriber level interferences from campaign level data. GDPR has created a greater need for a deep subscriber level analytics tool that doesn’t need to know who the individual is. If you don’t know the individual, and you put out a message to a group or persona, you’re in a different position with regards to GDPR than anyone who targets individual behaviors. Through our deep knowledge of the market and a bit of luck, we identified a need for a tool that doesn’t analyze subscriber behavior, and we built it. GDPR helped a lot. How do you prevent emails from going to the spam folder? There are a couple of ways our tool allows you to monitor whether you are hitting spam traps or not, but it’s not the prime function. The spam rate is the same as the open rate; it’s one of the metrics the tool will analyze for you. Touchstone can quickly identify which emails are going to the spam folder, and it gives you the ability to see what that email was. If you drill down, you will see the exact email with the subject line, and all the analytics around that specific email. Most importantly, you can analyze the creatives. TouchStone is the only tool that allows you to understand whether the deliverability failure is caused by your subject line, your creative or by the list that it went to. Once you identify it, it’s up to you to fix it using other tools available in the marketplace. Our platform is an analytics platform, and it does not send any emails. It speaks to your email platform via the API; it organizes and archives all the campaign analytics and creatives, and it structures the information so you can find out what’s going on; what are your successes and what you can do to further improve your performance. You can use it with commercial platforms like MailChimp, Salesforce, campaign monitor, .mailer, or anything you use to send emails out with. Touchstone interacts with that platform and provides the best analytics tools available in the market on top of the platform you already have. How do you see the future of email marketing in 5 years from now? This is one of the areas where my viewpoint is considered to be very controversial, but to me, it’s just common sense. In my view and Touchstone’s view, email marketing is about permission and address. If you give me permission to market to you, whether I send you an email, HTML, video, images, text, the only way to make sure you get it is to send it to your email address; it’s the digital equivalent of your home address. Without email addresses, e-commerce would be almost impossible. Email is here to stay; it will not go away because of its massive scale. It’s the only application that everybody everywhere uses. It’s impossible to imagine someone who has never received or sent an email in the developed world. There are lots of people who never searched the web, but most of them have used email because it’s such a powerful messaging tool. There are about 3+ billion email addresses in the world. For comparison, Facebook only has about 1.5 billion users. That’s the difference. Email is not dying; it’s living. What GDPR has done is that it allowed the user to tell the marketer, I want to know what you’re doing with my data. Most people haven’t fully come to terms with what it means for them. As marketers, we try to make people buy more things. We’re not in business to make people happy; that’s an outcome. If by buying the product you become happier, great. If not, I’ve still got your money. Any marketer will tell you that the biggest group of users are the ones that only buy from you once. I’ll give you an example of what that means. My business analysis of your behavior shows me that every time I show you a picture of a kitten next to a donut, you will buy a dozen donuts, and you won’t even know why you’re doing it. Let’s say I use that information again and again, and you keep buying donuts until you reach 250 pounds and get a heart attack; that sounds like a lawsuit waiting to happen. Someone might say hang on, you used my data to make me buy donuts until I gained 150 pounds! That’s what one to one behavioral analysis tries to make you do. Netflix is the masters in using the algorithm to understand behavior. They have a category of researchers called Taggers who write a full description of what’s happening in the movie, so it can later be used to locate the case-specific target audience. For instance, how do they know that someone who hates romantic comedies will watch this particular one? It has a Ferrari in it. That person probably doesn’t even know that they liked all the movies that had a Ferrari in them. That’s what one-to-one marketing is trying to get to. If you approach Netflix and say “I want to know how your algorithm is targeting me and what that targeting was”, according to GDPR, they must tell you. Now tell me that you want to do one-to-one marketing! By comparison, when you send a message to many people, no one can accuse you of using your knowledge of a person’s weaknesses to make them buy more. That is why supermarkets do not use the fact that you buy 1 dozen donuts every day to target you with slimming products. They just put it on a billboard, and it’s up to people whether they buy it or not, so they can easily say ‘I wasn’t targeting you. I was just selling my product“. So with GDPR, my prediction is that email is going back to the future – back to a more TV and broadcast advertising approach. If your prime focus is behavioral targeting, it will be hard to say that you were “just advertising” and it’s up to the people whether or not to listen to your message. The whole world is saying the opposite. They are all saying we will only send you messages we know you want or need. In my view, it’s only a matter of time until people understand they have privacy rights and start filing class action lawsuits against those one-to-one marketers. What can you tell us about the Touchstone Pricing Model? Touchstone’s freemium business model lets you experience the core functionality, such as data organizing and archiving, for free. It allows you to look at your email campaigns in a way you’ve never seen them before. The paid plan unlocks all functionality, so you can test subject lines, click rates, open triggers, abandoned shopping cart automation and more. If you’re a marketer and you’re looking for an easier way to stay on top of your campaigns, I invite you to give Touchstone a try.